Sometimes I get so caught up in crafting using regular supplies that I forget about using household supplies like foil. So what can you do with foil? For starters you can glue it on card stock and emboss with an embossing folder or texture plate. Or you can dry emboss with a dry ink pen and maybe even gently rub ink over it. The foil can be crumpled up and unfolded and then inked or left as is. On top of the colored foil I glued mylar film. I bought the textured mylar years ago at a dollar store and alas have not been able to find more of it. The scallop panel is another that I had the paper wrong on the mat and so the scallop did not cut on an edge. I inked it with Brilliance Sky Blue. Then I brushed Deco Arts Twinkles paint over it thicker in some places to give the illusion of snow drifts.Martha Stewart coarse crystal glitter was sprinkled on top of the paint. The snowman is a print and cut. He was glitzed up with glitter gel pens. Thank you for stopping by and do come back. I am not very patiently waiting for a bunch of goodies to be delivered so I can play. They arrived at my local Post Office this evening so I should have them in my hot little hand by tomorrow afternoon at the latest. Normally I don't do sketches. They seem to take me longer. 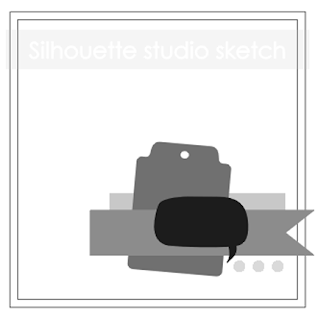 However when I saw on the Silhouette Blog the Thursday sketch and that it was a challenge I knew I was going to want to come up with something. I started by looking through the Studio library. There are lots of files in there that I have never used. Many of them free files. The" love you bubble" was one of them. The different tags I have used. The tag I used for the card I made is one of my favorite ones. In fact I even made a shaped card using it. This is how I did the card and what supplies I used. The background is a pattern paper by Me and My Big from the Specialty pad. I decided that it was about time I started to use card stock from that pad. Originally I had cut out a piece of gray card stock and had even swiped black ink over it as I was going to heat emboss hearts on it for the narrow strip. I couldn't find my small heart stamp and decided that the black was too stark. So instead I cut a scrap of the pink diagonal card stock. I think I like it better. I wish the dollar store had more of the card stock as I really like it. The tag is cut from gray card stock and then inked with distress tea ink. I played around with different craft floss and decided to stick with the variegated brown for the bow. The pink I had looked to me like it was more orange. The pennant was part of a free cupcake topper file from last year. I just cut one end off. Originally the speech bubble was filled with a polka dot of pink and blues which is why I inked this piece pink and blue. I decided rather than cut out another piece to go ahead and use it. The hearts are foam hearts leftover from a package I bought years ago. I wish I would have had light pink but I only had the darker pink and white left. I had played around with some glam rocks but decided that I liked the foam hearts better. So how did I do? It is not exactly like the sketch but it was fun to play with the love you speech bubble file. As well as to put my own spin on the layout. Thank you for stopping by and do come back. I have new toys coming and still have the embossed glue sheets and other techniques to share with you. I was playing around with my camera but I just can't get a picture showing the real beauty of this with the pink and blue colors. Then using a plastic scraper for pans although you could use a piece of cardboard or old credit card I scraped Gesso over the embossing. Once dry I swiped orchid and sky blue pearl ink over it. (I wish I had more pearl ink pads but alas I only have these two.) I could have used blending chalks or other ink pad but I decided I wanted the soft look of pink and blue. Of course I could have left it white or even added color to the Gesso before applying it. I like how the Gesso turned out applying it over the embossed card stock. It gives it sort of an old plaster look. LOL! Also it disguised the fact that the card stock is gray. Oh and the Gesso usually dries fairly fast so don't worry you don't have to wait 24 hours. My frugal tip is to use your mistakes. Also if you spill coffee on your card stock,or it gets discolored in some other way don't throw it out. Gesso it or paint over it. I use Folk Art Gesso because I can buy it inexpensively at Michaels. Also it is a good size container for me as I worry that in the larger sizes the Gesso might become too thick. Any Gesso would work. Remember that Gesso can be colored. I've used alcohol inks and soap dyes left over from my soap making days as well as acrylic paints. I hope I've inspired you to try Gesso if you haven't and to used your embossed images in a different way. So why not just emboss well the answer is because for me it is fun to play around and see if I can make an art piece. Thank you for stopping by and do come back. I've been playing with making glue sheets using an embossing folder and will have a card soon to show you using one. I'm still in the playing stage trying to decide what I want to back the glue sheet with. The leaves are falling and now is the time to collect some leaves for crafting purposes. I decided to experiment with leaves after all they are free. First I attached leaves to an acrylic block and tried stamping using an ink pad. Didn't really work out. (Later I'll try paint) Then I decided to tap the ink pad on the leaves and then placing the leaf ink side down and running a rubber brayer on the leaf. I tried with different types of ink pads and decided that I liked the dye ink the best with Stazon Rusty Brown ink running a close second. I used Tim Holtz tea dye distress ink. Because there was other inks on the leaf from play it picked up the color of some of those. One advantage of using dye inks is it dries fast so you don't have to worry about the ink smearing if you decide to rub blending chalks over your image like I did here. The side pieces are made using a wax food handler square which I painted with metallic watercolor straight from the tube. Another idea for using leaves is to arrange them on your scanner and scan them for a digital image. If you have a cutter that allows you to do print and cut this would be a great way to get the look of leaves without using the actual leaf. You can arrange leaves on your card stock. Stick them down with masking tape made into a loop. Spray with glimmer mist or a color spray. You will end up with a wonderful outline of your leaves. I can't wait to try my metallic watercolor paint with leaves as well as acrylic paint to make prints. I also want to play with using leaves with embossing enamel to make prints and some other things. How do you use leaves in your crafting? I would love to know. I come by my miserly um I mean my frugal ways naturally. My dad was the master of turning trash to treasures. I think Mom would cringe when he went to the dump because she knew he was apt to pick through stuff and bring something home. Like the Aladdin lamp teapot I still have. I remember one time he came home from a thrift store with wooden chairs which were in pieces that he paid something like a quarter for. He managed to restore one chair out of all the pieces and I believe at the estate sale that it sold for something like $100. Not a bad investment. Mom was frugal in her own way. She would use envelopes as scrap paper and even the back of letters. She explained that she had gotten into the habit when she was stationed in a country where paper was scarce. So you see I come by my ways naturally. I do throw out scrap paper when it threatens to take over the place but I also recycle a lot of it. In fact my sister laughed when I messed up stamping and told her I was taking the piece home to Gesso and reuse. Here is the card I made with the shape I messed up. A card base that I cut out for a card but didn't have the fold line in the center nor placed on the mat correctly to cut out. I had put it aside knowing it would be used for another card or to cut shapes out of. As well as an extra print and cut shape that I had cut out when I cut out a bunch before going to seeing my sister not knowing how many she would want last year. 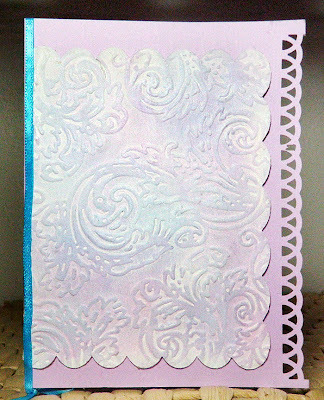 When I started this card all I knew was I wanted to use the scallop rectangle that I had messed up on stamping. First I spread a layer of Gesso over the card stock using a empty gift card. I then let it dry overnight. The stamping showed through the Gesso but that was all right as I knew I was going to use ink over it. I decided I wanted to see what color cherry pink Stazon would turn out to be. I had bought the ink pad at a craft yard sale. I took a wedge cosmetic foam pad to apply the ink in a circular motion. 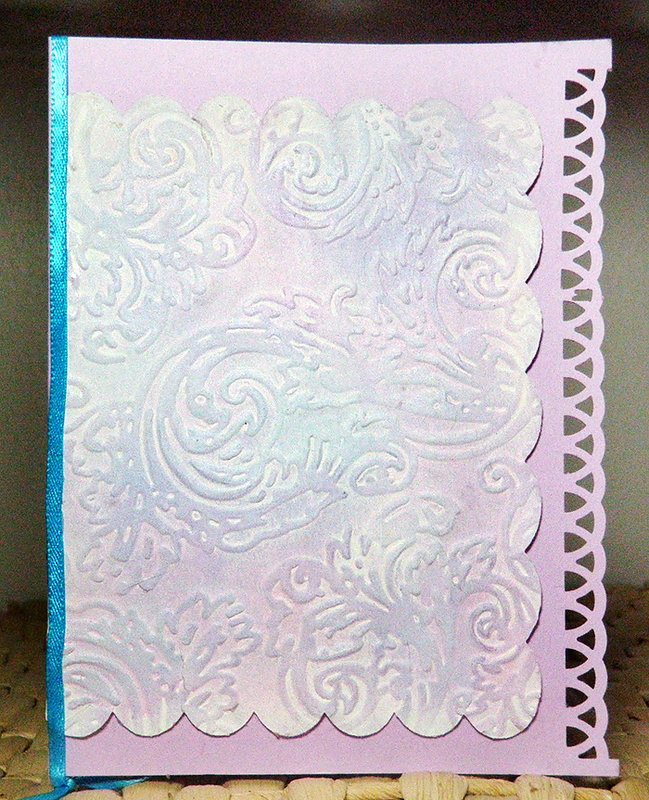 Then used the Divine Swirls embossing folder. I decided to have it de-embossed instead of embossed. I tried several different colors of card bases but didn't find anything I liked. Then while looking through my leftover shapes I found this card base that I had messed up by getting the fold line in the wrong place and the card stock placed wrong direction on the mat so that the scallop was cut off on one edge. I went ahead and used both a silver and gold leafing pen on the straight edge inside. You can see it peeking through in the picture. I decided that the Angel needed something so took my jelly roll star glitter pen and edged it. I love just that subtle touch of glitter. 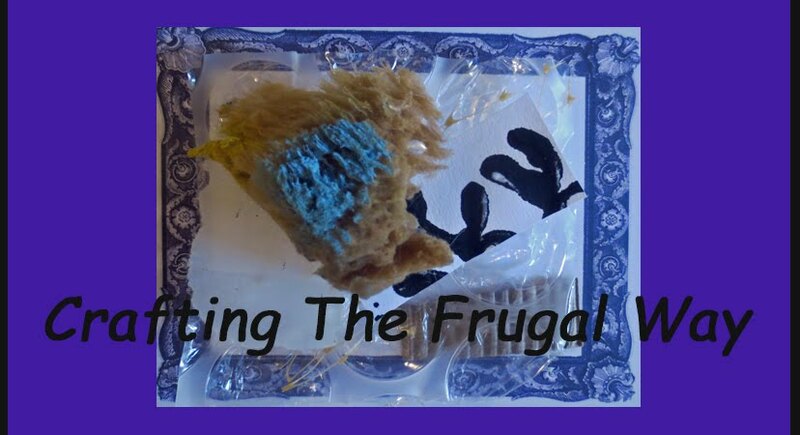 There you have it my miserly um I mean my frugal card. Thank you for stopping by. I hope I have inspired you to use perhaps something you might have messed up in a new way instead of throwing it out. Oh and if you want to buy Gesso and are near a Michaels if they carry Folk Art paints look for it probably near the bottom shelf. A bottle cost me $2.99 in comparison to another brand over with the artist paints for $6.99 for the same amount. LOL! The clerk didn't even know they had the Folk Art brand and I just happened to spy it while looking for something else. Over at the Silhouette Plus Forum one of the members Ted shared his gorgeous card he had made by scanning a stamped image and then after tracing the image welding it to a rectangle. That got me to thinking about the possibility of using a print and cut. It was a little more trickier as you can not just weld a print and cut to a shape. LOL! Although you can try and see what interesting file you might end up. It took me a bit of playing around but I figured out how to do it. I'm sure there is probably a better way to do this. LOL! I always seem to do things the hard way. Here is my card. Drum roll please! The background is DCWV glitter paper. It is a pain to cut as I always have to double cut in order to get it to cut all the way through. Since I have four 12x12 pads of it though I want to use it up so for simple shapes it will work. I edged my print and cut with Forest Green ink I just love the little extra dimension edging with ink seems to give. For those who want to know how to do the print and cut the directions are below. I hope they make sense. If anyone has an easier way to do this feel free to let me know by leaving a comment. I decided to take the Santa Bugs Bunny print and cut file which I bought last year during Black Friday. The first step is to take the image you want to use and release the compound path. Then separate the cut line image from the print image. The cut line image is the one that you will weld to your rectangle or whatever other shape you want to use. You will want the print image to have a transparent background but if using a Studio file you can't just take it into Photo Shop or another graphic program to make the background transparent. This is where the snip tool comes in handy. (By the way this is free software in some of the windows versions. But if you don't have it there are snipping programs available for free.) Snip the image and I use the copy image option in the snipping program. Then I open in Photo Shop a new image from clipboard. I use in Photo Shop the Magic Extractor to extract just the image which leaves a transparent background. Then save the image as a png. Now I don't know if this worked because I released compound lines on the welded image to delete a small section that I didn't want to cut or not. So you may have to use the release compound path before dragging your png image over where you want it. But I was able to drag my saved png image just to where the shape should be without it filling in the rectangle. I did have to tweak the size a little bit and play so that the cutting lines would be correct when it was cut. Make sure the cutting lines are turned off on your print image as you don't want it to cut out the edges. You only want the welded shape to cut. In your rectangle or whatever shape you used you can add text like I did. And group everything and then using registering marks print and cut like normal. This really is not as complicated as it may sound. LOL! It took me longer to figure out how to do it than to really do it. Thank you for stopping by and do come back. I've been playing with a metal stencil this week but alas the results are not as good as I was hoping for. My practice piece of using Gesso and the stencil turned out beautifully but then when I went to do it over a misted piece of card stock it was a disaster. I painted twinkle glitter paint over the practice piece and will be using it in a card as well as finishing some Christmas cards I had started while visiting my sister. It seems like just yesterday I was flying to be introduced to my first grandchild. I can't believe it but she turns seven. Where has the time gone. Anyway I was totally clueless about making her a card. Then I saw among my files this cute frog. She is really into frogs and so I thought he\she would make a cute card. Here is the card I finally came up with. The background, frog and text are printed. Then I cut them out using my Cameo. I edged the circle with copper ink to give it a little bit of dimension. The frog is edged with forest green ink. I painted Deco Art Crystal Twinkles paint on the frog and used Dimensional Magic on the eyes. I used a clear glitter pen on the mouth. He is attached to the card using strips of card stock folded into an accordion. This makes him flat for mailing but he will pop up when taken out of the envelope. The balloons were cut from a foil sour cream lid. I inked those with alcohol ink(dye ink didn't work and the pigment ink was too light for coloring the foil. Sharpies take too long to dry or I would have used those.) and glued them on scrap floss. Which was then tied around the frog's hand. I ended up having to attach the balloons to the card with foam squares as they were too droopy. I decided to add ribbon to the top and bottom to echo the color of the balloons. I hope my granddaughter will like it. That is all I have for now. Thanks for stopping by and do come back soon. I hope to finish the Holiday cards I started at my sister's house and post those. In the meantime I went thrift shopping over the weekend. I found some containers for organizing my ink pads and embossing folders/dies. 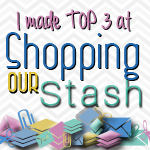 Now I am working on getting things more organized so I can spend more time crafting and less time looking for supplies. Today is a rainy,cold day. A good day for crafting and a good day for creating a card to enter in the Simon Says Stamp and Show Rustification Challenge. Here is the blog address if you would like to see the fantastic projects the DT did or if you would like to join the challenge yourself. It is open until Sunday. The background the heart is on is my faux metal paper made using a paper towel,gesso,and metallic watercolors straight from the tube. Here is my tutorial on how I made it. I need to get busy and make some more of it as what I made is almost gone. The heart is a free Studio file I just ungrouped the shape it came on. Normally I don't like the Studio patterns and prefer to use my own patterns for fill but I do like this plaid and thought it would be perfect for the heart. Especially since I was looking for a more masculine feel. The key is a public image. I traced it for a print and cut and added the text. Although you really can't tell here I printed one copy of the key and also cut out three other key blanks on heavyweight card stock. I glued all the layers together to get more of a chipboard embellishment look. Both the key and heart were edged with Cosmic Copper ink. It was a pain edging some of the areas on the key using a stiff qtip. The key is on a spiral paper clip. I debated about whether to use one of the colored ones I have or a copper colored one and in the end opted for the copper. I went ahead and used 3d foam squares to adhere the heart and a couple to adhere the key on the heart. How did I do on making a masculine "Love" card while combining "Rustification"? Thank you for stopping by. Do come back to see what I'm up to next. I have lots of ideas for cards and for playing. I'm sure with all the rain in the forecast I'll be doing a lot of playing and organizing of my craft supplies. I have a couple of pads of pattern card stock which I never seem to use. Mostly because the patterns are too big. I also have several pads of glitter paper that is plastic coated. LOL! Now I remember why I seldom use it. I had to double cut twice just to cut out the circle using the blade set at 10. Anyway after creating my diamond mat and cutting it out I played with it holding it over different pattern card stock Although the pattern is big it worked. And I knew when I saw the hint of purple in it what direction I was going as far as colors go. Once I decided what card stock to use I went ahead and misted the diamond mat with my homemade glimmer mist. I love just the hint of shimmer and just the hint of color. Also I love how the edges took more color. The thank you in the circle was a jpg I found. I decided instead of using it as a print and cut to make a cutting file out of it. I had to forget my idea of cutting it out with the glitter paper. It did not cut completely using the double cut setting and was tearing up the letters. I did cut the circle backing it out of the glitter paper after cutting it twice with double cut checked. You can't really see it but there are faint butterflies as I cut the letter piece with card stock from my 6x6 pad. of patterned butterfly card stock. I forgot about the o being a complete open circle when cut out. Luckily I kept the middle circle so was able to glue it in the middle. I decided to weave ribbon in the holes. Alas there was one too many holes so the end was poked in the beginning hole. Normally I would have started the ribbon so that a bow would be tied so it wouldn't matter but I didn't want to use a bow this time. I didn't like the way it looked and didn't want to redo it to tie a bow. I decided instead to make a small butterfly to cover it. I just happened to find a tiny scrap of purple card stock to cut my butterfly out of. Because of the small size the antennae tore off. I took scrap floss and wrapped it around the body tying it at the top. This wasn't what I originally had in mind but it seemed like this card had a mind of it own. I'm really pleased at the way it turned out. Thank you for stopping by and do come back. LOL! I'm not sure what I'll be doing next. I would kind of like to do something for the Simon Says Stamp and Show rusty theme but don't know if I will. Don't Throw That Can Of Spray Starch Out! Did you know that Spray Starch can be used for crafting? I didn't until I was looking for something on the internet and came across a post on making spray starch backgrounds. Of course you know me. I had to experiment making my own backgrounds. Now I want to cut shapes out of dark colored card stock and use the technique on those. While visiting my sister I played with a cosmetic sponge and my teal Stazon ink. I liked seeing the different effects I got depending on how I held the sponge. I didn't like the petals colored on my first panel so decided to make another panel when I got home. I inked this G Studio stamp with Memento Black Tuxedo ink and then stamped over my sponge background. LOL! I won't tell you how many months ago I bought this stamp and this is my first time to use it. I found Friday at a store some ultra-thin Sharpies which I used to color the center of the flowers and the stem. I decided to use the purple ribbon to make the purple in the starch background pop out. I don't know if I like the green card so may exchange it for another color. Since the panel is pop dotted with squares that are not super sticky it would be easy to swap the color. LOL! I'll have to see what my art critic says as I'll be sending the card to his mother. If you have spray starch and mica powder I encourage you to do some playing. LOL! Especially if like me you like to make messes. Thank you for stopping by. I am off to work on a Thank You card and to see if I can catch up on my blog reading. LOL! I have finally made it to the Saturday posts. I think maybe I subscribe to too many blogs. For this card I used the same snowflake frame as I did for a previous card. I don't know where I got the snowman image from but thought it would be fun instead of cutting him totally out to have some of the blue showing. I also at the time cutting out a bunch of snowmen was not sure how I was going to use them. The broom and carrot are colored with glitter gel pens. The trees are from a free Studio file. Just made a bunch of different sizes. Although I filled in with green in Studio I went ahead and colored the trunk with brown ink. Then took a qtip and forest green ink to add more texture to the trees. Before leaving to see my sister I had cut out several rounded squares in both white and gray in two different sizes. The larger square I used Stazon teal ink and a natural sea sponge in a circular motion. I did the same thing on the sentiment but for some reason it ended up with more of a greenish caste. The reindeer is stamped with rusty brown and the tree with forest green. Both inks also Stazon inks I bought at a craft yard sale. The stamps are Karen Foster Design. I was pleased at how well they stamped. Thank you once again Alice for this fabulous stamp set. I'm not sure who makes the Peace stamp it was in a holiday set I bought on clearance last year. This was a simple and quick card to do. I had also cut out some rectangle scallops to use. I love how in Studio you can re-size. This is the free Studio scallop label. The Merry Christmas is from the same set as the Peace. It is stamped with Red Pepper ink. I colored the stars in with a metallic colored pencil. I did not think to write down who made the snowman stamp. My sister has enough snow people stamps to open up her own store. I stamped him with Memento Black Tuxedo ink as I wasn't sure whether I wanted to use markers or colored pencils. I decided to go with color pencils. I used a white gel pen for the string attaching the mittens and a red glitter gel pen for the holly on the hat. I think my youngest granddaughter will love this happy snowman. Now I wish I had made more stamped images to make cards at home using him. There you have it my quick and easy cards. You don't have to spend a lot of time making holiday cards unless you want to. For interest you can use one square and then another smaller square as a diamond for the focal point. A scallop rectangle and a simple image can make a charming card. Thank you for stopping by and do come back. I have more cards that I started while visiting my sister but have not finished as the things I wanted to use with them I have here at home. LOL! I hope to work on them this week. In between perhaps doing some other cards. As well as playing with a stencil or two. By the way it is not too early to start adding to your holiday card stash. Of course I know for me that I'm going to have someone who is going to be looking for last minute hand made cards. LOL! Now I'm off to try to catch up with my blog reading. Wishing you Happy Frugal Crafting till we meet again. I must confess that I did not know what Steampunk was until I checked out at the library a book on making Steampunk jewelry. Then Kris on the Wishblade forum uploaded a Steampunk card cutting file. Not sure where it was at but I downloaded a cog border cutting file offered for free. Then from somewhere else there was a free pocket watch digi paper and a free single pocket watch image The images are a couple that were in a Dover Publication Sampler. So when I saw that Cameo Creations Challenge was having an anything goes challenge I thought it would be fun to come up with some Steampunk cards. I printed and cut everything out with my Cameo. Then while visiting my sister I glued everything together. Originally I was going to use this image with the cog border but after printing and cutting it out didn't care for how it looked. While showing my sister my spray starch and perfect pearl backgrounds she mentioned that this one would be the perfect background for this image. I used silver leaf to paint the line around the background and pop dotted it to the blank card base. I just happened to throw in this blank card with my craft stuff when I packed and was pleased at how well it worked out. I don't know what it is but I totally love this image. The colors and the fantasy of it all. The sentiments is from Teresa Collins Everyday Moments and it says "I want to always remember" The inside will say the days of dress up and make believe. This is Kris's Cog card. After cutting it out with the Cameo I heat embossed with copper. I didn't like the color of the background with the pocket watches so I inked the background with a distress ink. I also inked the edges of the image with the man and woman. I did the same as above to the two images here. For the cog border where there was a huge cog I made the pocket watch to fit where the printed cog was. I don't know if you can tell in the picture but the pocket watch was coated with Dimensional Magic so it looks like it really has a crystal. There you have my Steampunk cards which have been on my to do card list for almost a year now. I hope I have inspired you to try to put something like this together. It is kind of fun to make miniature works of art. LOL! Now off you go to make an anything goes project with your Silhouette. You still have time to enter the challenge at Cameo Creations Challenge It doesn't have to be a card either. Thank you for stopping by and do come back. I started some Holiday cards at my sister and will be finishing those and posting them. It was so much fun to share crafting supplies with her and we spent three glorious days crafting and laughing. LOL! I've come home with a longer to do card list and ideas. As well as a longer wish list.